A lightweight folding emergency or individual camper/ hiker stove. Opens to two positions for less heat or more heat and accomodates most camp cookwware. 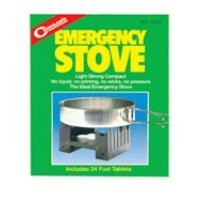 Burns one or more solid fuel tablets (see CL9565) depenidng on amount of heat desired. Each tablet burns approximatley 9 minutes.